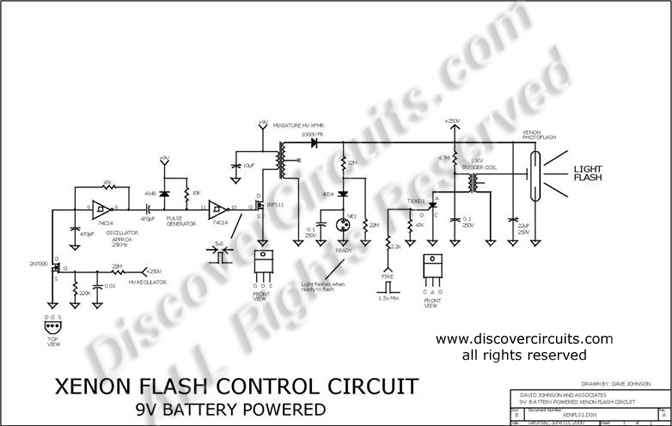 Circuit: 9v POWERED XENON PHOTOFLASH Controller__ Circuits designed by David A. Johnson, P.E. This 9v battery powered circuit is designed for remote control flash needs. A charge control circuit turns off the high voltage generator when the photoflash capacitor is fully charged. A neon lamp is included to indicate when the system is ready to flash.